I've often talked about the benefits of peachy/salmon colored concealers to correct dark, blue-toned under-eye circles. The first concealers of this kind that I tried (years ago) were the Bobbi Brown corrector in Bisque and Benefit Erase Paste. I loved the effect they had on the darkness that I primarily have in the innermost corners of my eyes/sides of my nose. I'm continually looking for drugstore alternatives to those kinds of products, and I've stumbled upon a few! 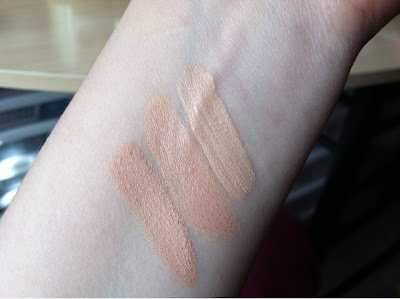 From left to right: Maybelline Dream Lumi Highlighting Concealer in Radiant, Pixi Correction Concentrate in Brightening Peach, and Wet n Wild CoverAll Liquid Concealer Wand in 811 Fair. The Dream Lumi concealers come in various skin-tone shades, but Radiant is definitely a peachy tone. I looks kind of deep when I swatch it, but it's surprisingly brightening in the eye area and really blends in well. It has a brush tip and you just twist the bottom for more product. I find this to be a bit thicker than most concealers in this brush-tip format, which I don't mind- it seems to cover better. I LOVE this product! The Pixi Correction Concentrate is so pigmented and works really well on a variety of skin tones. It feels very solid when you dip into the little pot, so this is one of those concealers where it helps to really melt it into the skin with the warmth of your fingers. This is probably one of the best that I've tried (outside of the high end options)... it's just the right shade to really do a good job with under-eye drama. This one I actually JUST found. 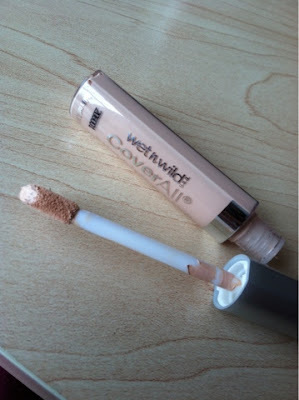 I was checking out the Wet n Wild stuff and realized I hadn't ever tried their liquid concealer. This shade in Fair has a slight peachy tone (less deep/orangey than the others- looks more yellow than it really is in the pic above), but I could see it being really nice and brightening for the under-eye area. I will report back on the coverage, but just playing around with it this afternoon-- it definitely gave my inner corner/under eye area a boost! Chatting right now with the lovely ladies on Beauty Broadcast Community! I have a headache, but Taisia recommended pinching my eyebrow with my thumb & index finger. It's actually helping! cool! Eva Mendes is on Ellen- she is SO pretty! Thanks, I will definitely be checking these out!!! Where do you find pixi products? I'm in Canada and have never heard of them, except from your videos! I've seen them at Target - I'm assuming they're in Canada. I have a question, how do these compare to say... Erase Paste? If we have a product like that, are these much better? Are they worth replacing what we might have? :) Thanks again for the little shout out! I'm glad the eyebrow pinching helped!! Where do you buy pixi products at? Target? I've tried the WnW concealer and didn't like it. It seems to grainy on me. My all time favorite peachy concealer is by Tarte with Maracujah oil. The medium shade appear quite dark right out of the tube, but believe me it blends out to a very natural "peachy" skin tone under the eyes. I have horrible undereye circles (something I was born with) so it definitely comuflages it. It's also very creamy and hydrating so you don't need to use too much and feels comfortable on the skin. I'm very fair skinned, would peach concealer still work for me? I love you for posting this! I have been searching and haven't found the right product for me yet. I have gotten great coverage from Covergirl and Olay Simply Ageless Corrector used in conjunction with my IT Cosmetics Bye-Bye Undereye. Not perfect, but my circles are extremely dark, and this is the best result I have had since I started looking for a peachy concealer. I am SO glad that I stumbled across the Pixi Correction Concentrate because it is my HG, for sure! I would buy it if it was ten times as expensive! One of the best things about it is how little you need to cover everything...I've had the same little pot for almost two years and I still haven't hit the bottom, and it still hasn't dried out! Glad to hear you like it too, Emily! I've heard great things about the Maybelline Lumi, it's just too hard to find here in Philippines. I second what Jolene asked. I too am VERY fair skinned. Would a peachy concealer work for me? Thanks for this post! I have such a hard time finding decent concealer. 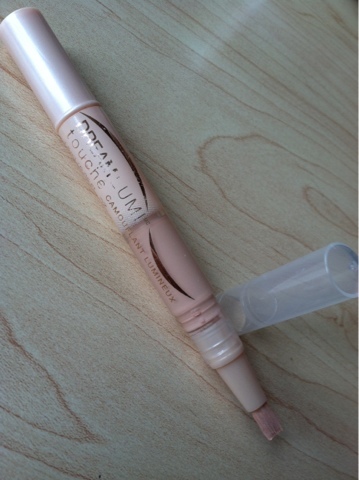 I've been using Rimmel True Match concealer for awhile which I really like. But, I definitely like to mix it up once in awhile! You should try the covergirl + olay correctors Emily! A big second (or is a third or fourth now) for the CG Simply ageless corrector, as well as the actual concealers. They have the most wonderful consistency, just melt into the skin while maintaining great pigmentation. It's a yellow, not a peach, and may be better for lighter skin tones than peach. 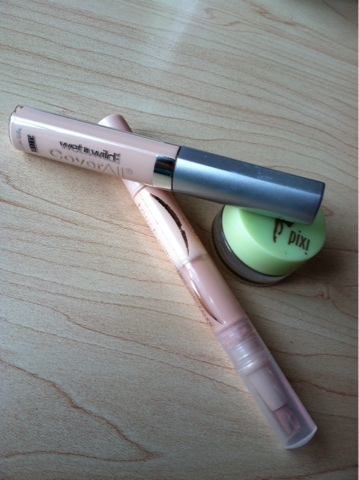 Also the maybelline instant age rewind dark circle eraser in brighten! Works greattt! 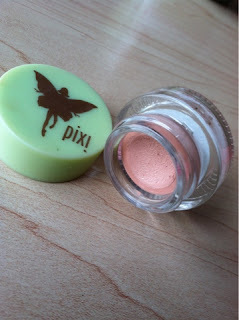 You totally hooked me on the pixi concealer, it is an everyday must have for me! I just got the pixi correction concentrate at Target a few weeks ago. I've been using a brush to apply it and wasn't thrilled, but now I'm going to try your tip on using my fingers to help it blend. Thanks! What is the difference between a peachy product like this and say the Covergirl & Olay concealer? Which would you recommend for a light makeup wearer for the most natural looking coverage? I picked up the Pixi concealer on your recommendation and I have been loving it!!! I use a short bristle duo fiber type brush (from the Rite-Aid Renewal line) and I'm happy with the results. I might try with my fingers just to see if its even better. Correctios, it's the Renewal shadow brush (they also have a smudger brush). Another great alternative is Bright Eyed by Coastal Scents in the shade Light. Great for concealing, correcting, and highlighting. It's a bit more pink than the Bobbi Brown corrector in Bisque. Easy to work with (just gotta warm it up a bit with your fingers) and blends easily. It's in a liquid form and comes in a tube. You get 20 ml / 0.676 fl oz for $9.95. Thank you for sharing- I could definitely use help in this area. And... I'm around the same skintone as you, judging by past foundations you've talked about. I really really love NYX concealer in a jar. It works perfectly for under eye circle. I found the Dream Lumi doesn't last long...not on the skin, but the actual product in the container. My favorite under eye find is the Stila Kajal Pencil in Topaz. It's a light peachy color. It's a very creamy formula, and it works wonders under the eye when set with a powder. It's a great multitasker too, because I also use it in the waterline and around my lips for that reverse lip liner effect. Blends beautifully! Ive recently heard MakeupGeek say that she uses a darker shade of concealer to hide her dark circles.. darkness covers darkness although I'm not sure if that works. I also have been wondering about benefits lemon aid. A yellow concealer for your eyes....a video about different types of color correction would be great. Do you ever feel like you should have actually gone to makeup school? You should check out the Coastal Scents Bright Eyed concealer, it has that peachy undertone and it's only $10. I have such dark under eye circles people ask me if I was punched in the face (wish I could say I was joking) and this covers them up flawlessly. Would the pixi color work on tan skin? I am golden caramel maybe some what darker in the revlon colorstay....would a orange correcter be too much? Please help me out. called the one-click Kodi installation method, needs Kodi APK could refuse to assist you, leaving you with an extremely expensive brick. They set you back new, as well as bestandroidtvbox it easy to hide away as well as although it for one. On tablet computer or phone along with the same Directv that you view in the house. DIRECTV Sign In Register for autobill pay and also have your monthly repayment debited from your credit debit.